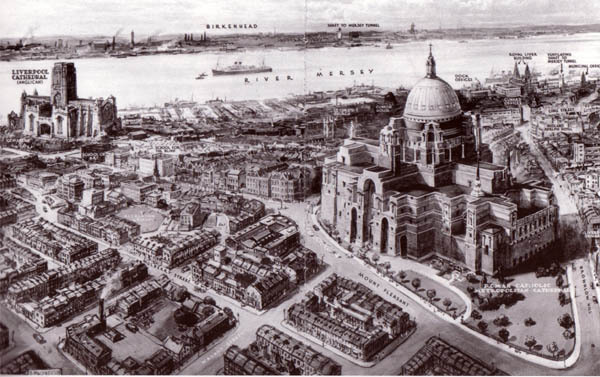 Above, postcard showing proposed Roman Catholic Metropolitan Cathedral on right and the Anglican Cathedral on the left. 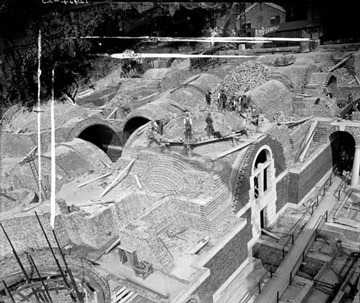 Below, the Lutyens crypt under construction. Bottom, the cathedral as completed. Sir Edwin Lutyen's scheme for the Metropolitan Cathedral of Christ the King, Liverpool is oft hailed as the greatest building to never have been built. Work on the crypt was structurally finished but then the project was cancelled. The foundation stones were lain on Whit Monday, June 5, 1933 and work continued even after the start of the Second World War, until 1941 when the growing restrictions of wartime finally meant that construction had to cease. In 1956 work recommenced on the crypt, which was finished in 1958. Thereafter, Lutyen's design for the cathedral was considered too expensive and so was abandoned and a new and truly modern design by Frederick Gibberd was adopted and ultimately completed atop the original crypt. 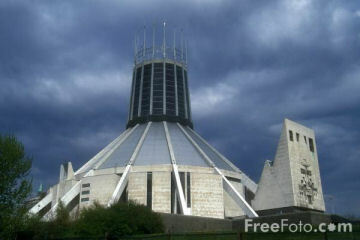 Commemorating the many Irish labourers among the swarms of Liverpool Catholics, it was genially nicknamed "Paddy's Wigwam". Why Metropolitan? Liverpool is fortunate enough to possess two mighty symbols of the Christian faith in the two Cathedrals which face each other at opposite ends of the aptly-named Hope Street. Both are dedicated to Christ: the Anglican one to Christ and the Blessed Virgin and the Catholic one to Christ the King, so it helps avoid confusion to refer to one as Liverpool Cathedral and the other as The Metropolitan Cathedral.